Jurys Inn Cardiff is located right in the heart of this historic and vibrant city. The hotel is a minute stroll form the nearest train station Cardiff Queen Street station. The nearest bus station is just a 2 minute walk away on Greyfriars Road. Cardiff airport is a 35 minute drive and is also accessible by bus. There is on-site car parking available for 55 cars at an additional charge of £15 per night for residents. Alternative car parks are available nearby, see the Car Parking tab below for further information. Head west on A4161 and continue to follow. Turn left onto Kingsway, continue left onto Greyfriars Rd and then turn right onto Park Place. Take a left before Bellini’s into the car park. Turn onto Park Place and continue until the first set of traffic lights. You can turn right or left onto the A4161 or continue straight onto Park Place. Jurys Inn Cardiff is a 5 minute walk from Cardiff Queen Street station. When leaving the station, take a right on Station Terrace, turn left onto Queen Street and then turn right onto Park Place. Jurys Inn Cardiff will be on your right on Park Place. We have on-site car parking available for 55 cars, including 2 accessible spaces which are available on a first come, first served basis, at an additional charge of £15 per night. There is also an NCP near the hotel on Greyfriars Road where guests can park for £24 per 24 hours. Jurys Inn Cardiff can validate guest parking tickets for this car park giving a 15% discount on this charge. The TrawsCymru T9 bus runs every 20 minutes and takes approx. 40 minutes to reach the city centre. Tickets cost from £5. 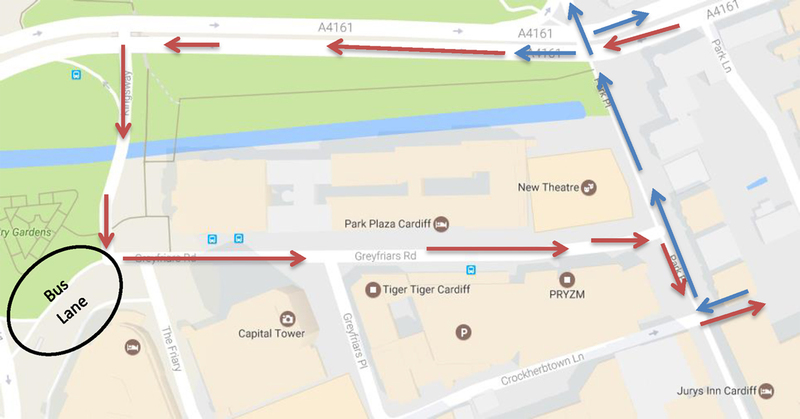 The bus stops at Customhouse Street (Stop JL) and from here it is a 10 minute walk to Jurys Inn Cardiff hotel.